As we browse the internet we are seeing more security warnings that suggest that you do not continue to the desired web site, these warning typically relate to the security certificate that the site uses and the errors could indicate that the site has been hijacked or simply that the legitimate site has an error on the certificate. Sites that are secured by a security certificate start with https:\\. 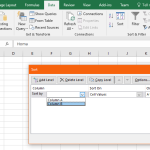 A quick tutorial on sorting data in Microsoft Excel. Windows Small Business Server 2011 Standard Edition and Windows Server 2008 R2. Windows Updates repeatedly fails to install "Definition Update for Windows Defender". Manually updating definitions through Windows Defender but this fails. Running "mpcmdrun.exe -RemoveDefinitions -All" and then "mpcmdrun.exe -SignatureUpdate" but this fails with the error "ERROR: Signature Update failed with hr=8050A005". sfc /scannow finds no errors. Alert! :Your mobile No is Selected as a winner of £2750000 on uKMobile Lotto. Go to www.aumob.net to claim. enter Ref:AU564718812.helpline: info.ukmobile@cash4u. Security Note: SMS Spam what is it? Spam can be classed as unsolicited messages, typically from senders who you do not know, but can be a familiar sender who has been compromised by hackers. Phishing is messages that request you contact them by opening a web link, replying or making contact via phone. These senders are after your personal details and pretend to be a legitimate company. They are phishing for personal information that helps identify you, bank account verification etc. Keep in mind that little bits of personal information can build a complete profile about you and WILL be shared within the hacking community. Windows: The folder contains items whose name is too long for the recycle bin. 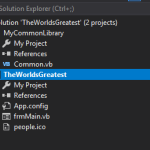 In Visual Studio 2017 Installer Projects – Part 1 we prepared Visual Studio 2017 for creating installer projects, In this article we are creating a simple application to use as our test application that we want to build an installer. 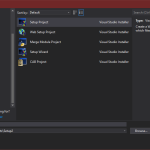 In this series of articles we will install the Visual Studio 2017 Installer Projects and walk through creating an installer project for a simple Windows App. 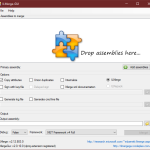 Graphical interface to the Microsoft ILMerge utility. Makes it merging multiple .NET assemblies easy and hassle-free.